If you’re looking for a sophisticated lunch or dinner in Madrid, look no further than Cilantro Gastrobar. We stopped by for lunch one day after reading a little bit about the place on Conde Nast and of course, they were spot on. This place serves some really nice food that makes for pretty pictures and a satisfied belly. We made ourselves comfortable on the outdoor terrace where we could easily people watch while enjoying the summer air. 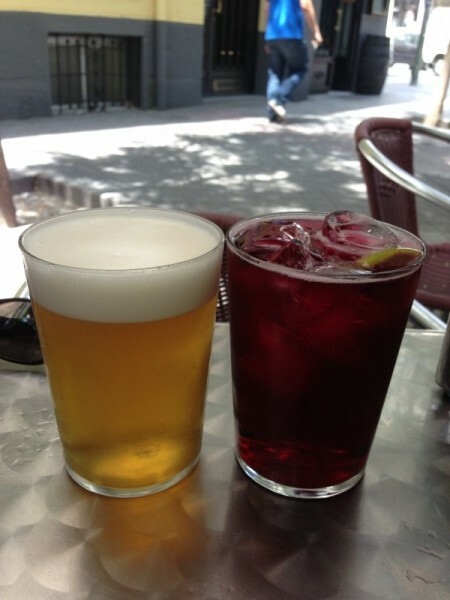 The frequent sips of cold Spanish beer and sangria tinto verrano didn’t hurt either. 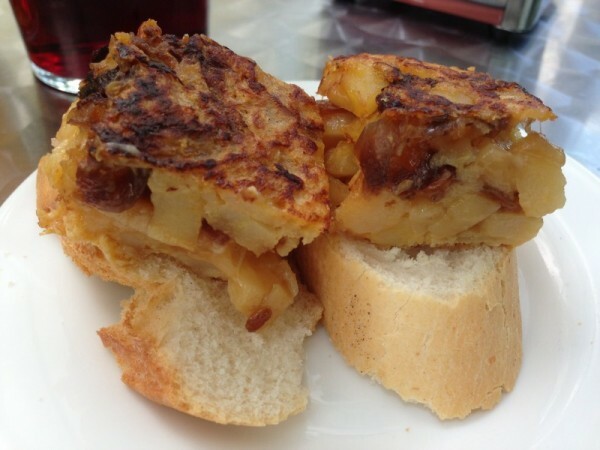 We were started off with some bread and a generous square of potato cake placed right on top. We chose to lightly taste the dish rather than stuff our faces – at least, some of us did. We ordered more than enough from the menu and eating too much of the free stuff (as good as it tastes) tends to ruin the appetite. I think we’ve all been there before. 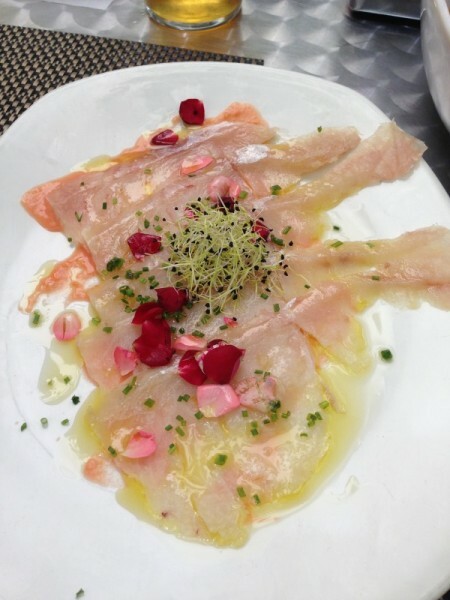 Then, the most beautiful plate of cod carpaccio arrived. Tender slivers of cod were pounded to fingernail width and laid across the plate in a diagonal fashion, one overlaying the next. The fish was drizzled with a fragrant olive oil from the Catalonian countryside and sprinkled with rose petals and a handful of summer shoots and buds. Right? Cod is known to be a particularly salty fish, especially when prepared the Spanish way. This dish was no exception. Delicious, yes but you get your sodium/iodine intake for the day for sure. Be warned. 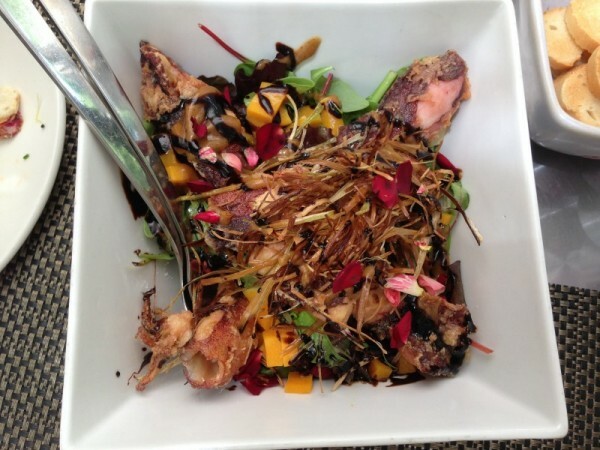 The baby squid salad was hearty and filling – more so than either of us had expected. Composed of diced squash, mixed greens, four fried baby squid and a good dose of caramelized balsamic vinegar dressing, the salad was a success. We weren’t too sure what the roots/veg were on top – maybe thinly cut burdock root? Note that the salad is good for sharing as a starter or can serve as a main for one person. 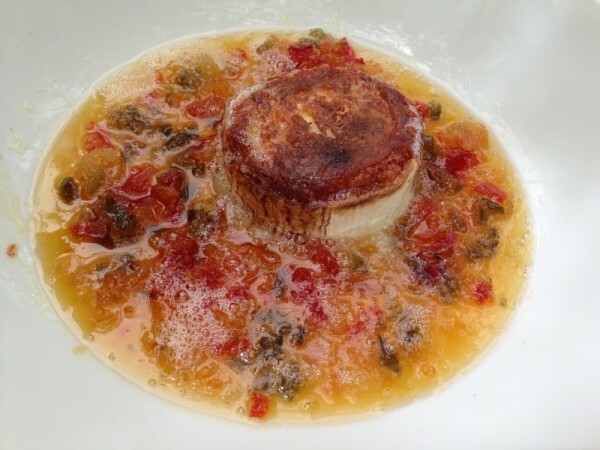 The goat’s cheese with three pepper sauce was almost like a dessert in itself. A whole small wheel of cheese to ourselves! It was baked to gooey, cheesy perfection with a little char on top and surrounded by a sweet, almost cloyingly sweet, concoction of red, green and orange peppers with a sort of honey stickiness holding it all together. Eating it straight was an experience in itself – after the first couple bites though, we wished we had some crackers or bread or something to pair it with to offset the intensely sweet taste. Finally, the grilled squid. Just look at that. Tasted as good as it looks, I’ll tell you that much. Served with a ratatouille and bathed in a vinaigrette of its own ink and again, sprinkled with rose petals, the colors of the plate just popped. 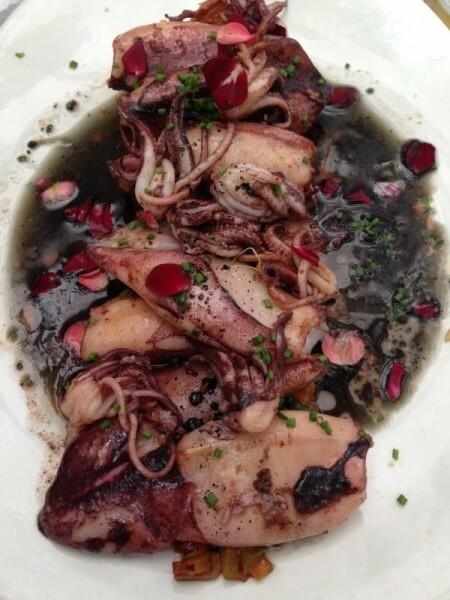 The squid itself was tender, hitting the right consistency between chewy and just chewy enough to enjoy and swallow easily while remaining delicate all the while. We had a good time at Cilantro and would go back without hesitation. Next time, we’re prepared to order a little less and lean heavier on dishes with less concentrated salty or sweet flavour profilings. All in all, Cilantro is a good bet for some pretty fantastic, if not intense, Catalonian food. 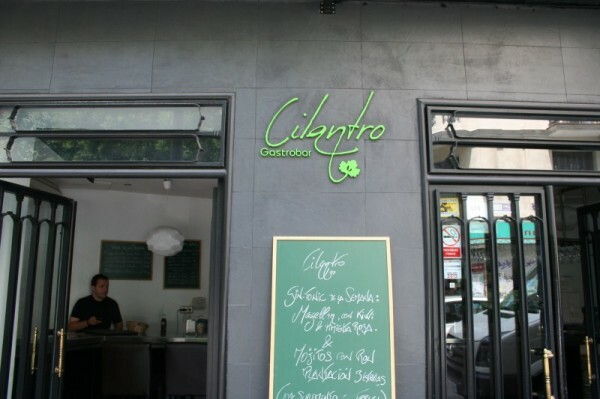 Tags: Cilantro, Gastrobar, Gastropub, Lunch, Madrid, Spain, Tapas.